The Cleaner 2012 was available as a giveaway on April 4, 2011! 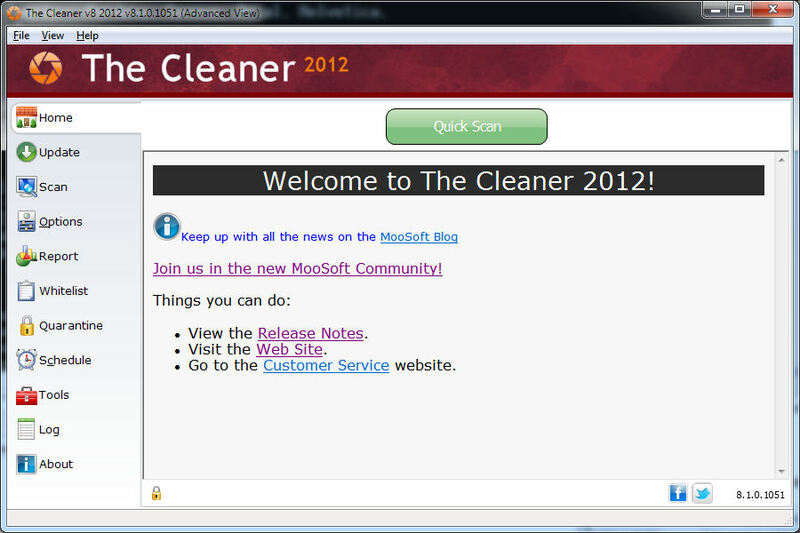 MooSoft's The Cleaner 2012 is a powerful anti-malware program. The Cleaner detects and removes malware that is often missed by anti-virus software. It delivers one of the quickest and most thorough scans on the market. It has on-demand scanning for single drives, folders or files or it can scan the entire computer. The Cleaner has been in development for more than thirteen years and is used in over 140 countries. How would you improve The Cleaner 2012? Get on a better web hosting server, one that can withstand lots of traffic. Thanks Buddybud, Will put it to good use! Apologies for the delay. We are still going through email from the promotion. Unfortunately we cannot manually supply everyone with a registration code that missed out. We hope you will try again during the next promotion. @ Daniel Otis It's been about 24 hours since I installed The Cleaner and still have the 0 days registration error, and after an update the databases all showing a red encircled exclamation mark next to them. Any ideas if there may be something I missed? @ Daniel Otis It's been about 24 hours since I installed The Cleaner and still have the 0 days registration error, and after an update the databases all showing a red encircled exclamation mark next to them. http://i1017.photobucket.com/albums/af291/Sparky362/TheCleanerRegdays0.png http://i1017.photobucket.com/albums/af291/Sparky362/TheCleanerAfterUpdate.png Any ideas if there may be something I missed? @175: Fine, I'll take that. But still, it would have been nice if we received some sort of notification about the issue, instead of making us guess why we were cut off. According to the Moosoft website - 37,486 downloaded the offer...amazing. Installed Cleaner 2012 on XP SP3 machine with no problems. Retrieved code and applied update with no real problems. Update stopped because Cleaner was running (my fault)- shut down Cleaner and update completed correctly. First quick scan took nine minutes and found two genuine problems. Some users still didn't understand, that the GOTD project is not a charity but a business project, and that the users of GOTD don't have any natural right to get every day a never ending registration for a software of their choice. There have been a lot of problems with today's giveaway, yes, but MooSoft is known as a reputable company, and I hope we will get their software even in future, hopefully with less glitches. I am one of the unlucky users who can't run The Cleaner (see my first comment #106). I couldn't eliminate that error. Nevertheless I want to thank MooSoft, Daniel Otis and GOTD for the opportunity to get this programme. PS: Sorry for the rant, but I have to vent sometimes, reading everyday ungrateful and greedy comments. Now, as this campaign goes to it's end soon, I want to thank Daniel Otis for his help and for answering our questions. And for bearing even the silliest comments and accusations as "...just so they wouldn’t lose any money", posted by a wannabe hacker who tried to circumvent the registration: "...I did my best to keep the 2010 license work (and I’m not sure if it did, because I was also trying to get the code to work on 2011)". (I deleted the thread he linked to.) Some users still didn't understand, that the GOTD project is not a charity but a business project, and that the users of GOTD don't have any natural right to get every day a never ending registration for a software of their choice. There have been a lot of problems with today's giveaway, yes, but MooSoft is known as a reputable company, and I hope we will get their software even in future, hopefully with less glitches. I am one of the unlucky users who can't run The Cleaner (see my first comment #106). I couldn't eliminate that error. Nevertheless I want to thank MooSoft, Daniel Otis and GOTD for the opportunity to get this programme. graylox PS: Sorry for the rant, but I have to vent sometimes, reading everyday ungrateful and greedy comments. It seems that people either have forgotten or are unaware that having more than one anti-virus and or malware program is never a good idea. It can lead to conflicts and hog resources. If you are satisfied with the program you are running why change? A good rule is "If it aint broke then don't fix it"
OTOH, I was able to generate multiple keys by just refreshing the page again. BTW, Threatfire is a freeware alternative I have been using for a while. It is really good. Windows 7(64): Downloaded, installed and registered with no problems. When I run it, everything looks fine in both basic and advanced views. When I try to run any kind of scan, nothing happens. With quick scan the progress screen pops up but all fields are blank and "stopped" is indicated at the bottom of the screen. Other scan modes do nothing at all. I figured it may be a compatibility issue with other antivirus programs and disabled them. Same problem. Will not scan my system. The portable version doesn't include the real time guard. There are already many free alternatives which are proven. You have mentioned the best along with other readers. Why to use an extra portable and limited for a year, since the great free are always free?! The whole advantage of todays offer (generous one) is the real time guard which plays along very well with other installed avs (bitdefender is very strange, its not Cleaners fault). Malwarebytes and Emsisoft ask for money when it comes for real time protection. This is the free gift today. For a year of course. 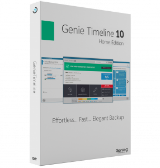 And this brings a note to newbies: ALL commercial security software uses the time model, eg 1 year, there is no such app for free with lifetime updates. 179 has now been corrected. just exit prog and open again to verify 365 day lic. thanks again for letting us try for yr.
179 has now been corrected. just exit prog and open again to verify 365 day lic. thanks again for letting us try for yr.
thank you for this.. i appreciate moosofts efforts, and gotd!! as far the best impprovemet idea i notice it detects system internals task manager as malware. also it detects my tweaking ultity that disables the regedit as malware.. besides these few false-positives i think its a good product. may i suggest a option within the main screen itself to disable the realtime protection on a permanent basis.. i would like to use this as a manual backup to my other purchased malware program that does have this option. very troublesome that i have to exit off the realtime after every re-boot. or disable in autoruns. please also add a option to disable logging!! i want to be able to choose if i want logs or not.. dont just set it on auto-pilot.. these are the two most important suggestions i instantly took notice of.. thanks again for a wonderful product..!! First I wanted to say thanks to Gaotd and MooSoft. I visit Gaotd every day but don't always download the given program. The only reason I am trying today's is because of Daniel Otis has been paying attention and helping, most authors don't. I also found the portable and I am currently running it. I always prefer a portable over an installed version. I like the easy way to get rid of the software if needed, and installers tend to overwrite system dll files. This can wreak havoc on other installed programs. I am currently running bblean as my shell. The Cleaner dies on start up with an error about the taskbar. With bblean I don't have a taskbar. I have switched back to explorer and will continue to do so when I need to scan, but it may get tiresome. @Daniel Otis if you want more info on the error, and think that you'll try accommodate other shells, I'll be happy to forward this error to MooSoft. Ps. Quick scan took 4 minutes 52 seconds for a quick scan and found my sptd.sys file. I am also running Daemon Tools. Once again thanks Gaotd and especially Daniel Otis for taking such an active part. First I wanted to say thanks to Gaotd and MooSoft. I visit Gaotd every day but don't always download the given program. The only reason I am trying today's is because of Daniel Otis has been paying attention and helping, most authors don't. I also found the portable and I am currently running it. I always prefer a portable over an installed version. I like the easy way to get rid of the software if needed, and installers tend to overwrite system dll files. This can wreak havoc on other installed programs. I am currently running bblean as my shell. The Cleaner dies on start up with an error about the taskbar. With bblean I don't have a taskbar. I have switched back to explorer and will continue to do so when I need to scan, but it may get tiresome. @Daniel Otis if you want more info on the error, and think that you'll try accommodate other shells, I'll be happy to forward this error to MooSoft. Ps. Quick scan took 4 minutes 52 seconds for a quick scan and found my sptd.sys file. I am also running Daemon Tools. Once again thanks Gaotd and especially Daniel Otis for taking such an active part. @179 Zero days on the about screen means the server could not be contacted. This should clear up after the promotion. I have sent email to help for registratin error. I just got code and now reg says o days left. I was one having ip adress issues. now not sure if post here or there site help.. do both see which has answer.. I have sent email to help for registratin error. I just got code and now reg says o days left. I was one having ip adress issues. now not sure if post here or there site help.. do both see which has answer.. did install fine. Uninstalled program then reinstalled. Appears to be registered this time. Thanks moosoft and GAOTD. Well still can not get the code. Really did want to try. Have Malware bytes and IObit but read this is a goodie. I never have problems getting to sites and have extremely fast internet. I tried to get the code via IE Explorer and Mozilla Fire Fox. Obviously to no avail. Good Luck to the rest of you. I give up. )-: Oh well, maybe they will offer it another time and make it easier for people to get. @174 that is not what happened. We bundled a code with the installer instead of giving away individual ones like this time. That code was taken and given to warez sites and spread around the Internet. To date almost 600,000 people are still trying to use that stolen code. We had to disable it or lost millions of dollars in potential revenue. This time we are giving out individual codes. If one is stolen and distributed we can shut that code off without hurting everyone else. I hope MooSoft will treat us better than last time. 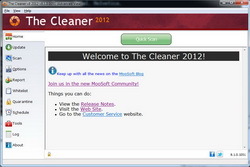 When they gave away The Cleaner 2010 a while ago, the had a new release of The Cleaner 2011. Since The Cleaner 2011 was a free upgrade from The Cleaner 2010, they didn't want to go and lose a whole bunch of money with GOTD users upgrading from 2010. So they blocked the registration key, which meant that current users had only a couple of months to get updates and use the program. I did my best to keep the 2010 license work (and I'm not sure if it did, because I was also trying to get the code to work on 2011). But it just goes to show you what a developer will do, and ditch thousands of legitimate users just so they wouldn't lose any money. Installed fine, Regged fine, then i saw that its only a year subscription, Uninstalled fine. SET A RESTORE POINT BEFORE YOU INSTALL ANY SOFTWARE!Makes un-installing very easy. I read all 144 comments before downloading the software. I installed it and registered. Exited the program and restarted. Message said program has expired. I don't have the time to play around for a couple hours to get it to work so I restored PC back to before install. I did not rate the software because I never used it. SET A RESTORE POINT BEFORE YOU INSTALL ANY SOFTWARE!Makes un-installing very easy. I read all 144 comments before downloading the software. I installed it and registered. Exited the program and restarted. Message said program has expired. I don't have the time to play around for a couple hours to get it to work so I restored PC back to before install. I did not rate the software because I never used it. it says "Elapsed time 40637 days, 18 hours, 21 minutes" and counts by seconds...and "Estimated Time" always stays as "Calculating". This software does not work for me at all. Looked promising from what I read but not ready for Prime time.....at least on my machine. Installed fine on Win 7. Registered fine and Updated fine. Problem is it will not scan. I click "start" and nothing happens. I click "resume" and it says "Elapsed time 40637 days, 18 hours, 21 minutes" and counts by seconds...and "Estimated Time" always stays as "Calculating". This software does not work for me at all. Looked promising from what I read but not ready for Prime time.....at least on my machine. @ 143 - Well, if I was a gluten for punishment I would install, but I HATE computer pop-ups that are driven by a piece of software I just installed. No thanks - but - I did find it curious that no one else complained of pop-ups - maybe because they told the software to fix the "problem" at the first warning. Still, I would like to hear from others concerning pop-ups during a malware scan. I had no problems downloading/installing/registering other than I had to restart the download 4 or 5 times to get it to actually download past about 45%... no idea why. I must also be misunderstanding the definition of "Quick Scan"????? 2 things - There is nothing wrong with my display properties (nothing disabled), and I have absolutely NO problem opening task manager. Installed easily including registration code on Win 7 home premium 64. Way less than a minute to install, register and update! Sweet give-a-way. 1 full year with updates free. I think Daniel Otis has got to be a most stand-up guy. Not only has he offered a good program, but takes an active roll in reading and answering complaints. 2 thumbs up. You can't find many that will do that, now days. The deepscan on my netbook took 2hrs and 21 seconds. The smartscan took 7 minutes. I have avast free as my antivirus, I regularly sweep with spybot portable for malware/spyware you can get for free at portableapps.com. I swept with an all-in-one to get rid of top cookies (I happened to use Glary free this time). I found 0 spywares using the portable The Cleaner. So I try to avoid monthly and yearly payments when I can. If I buy a program and a programmer is very busy then I'll buy the upgrade. I'm grateful for Giveaway of the Day for their free offering and particularly MooSoft for today's offering. The deepscan on my netbook took 2hrs and 21 seconds. The smartscan took 7 minutes. I have avast free as my antivirus, I regularly sweep with spybot portable for malware/spyware you can get for free at portableapps.com. I swept with an all-in-one to get rid of top cookies (I happened to use Glary free this time). I found 0 spywares using the portable The Cleaner. I mentioned earlier that I didn't care for the $30 a year model (when I can get a slightly less convenient product for free). The problem for me is that $60 compounded ten percent (a $30 antivirus and $30 malware) $370 5yrs $962 10yrs $3445 20yrs $10,936 30yrs $76,916 50 yrs ($60 yr compounded ten percent yearly) So I try to avoid monthly and yearly payments when I can. If I buy a program and a programmer is very busy then I'll buy the upgrade. I'm grateful for Giveaway of the Day for their free offering and particularly MooSoft for today's offering. I got this one last time around and it lasted maybe a month and expired. I emailed moosoft and they said they killed it because the activstion key had been given out on the web. Why the year limitaion? CCleaner and free Auslogic software doesn't limit us to a year. Are there any independent ratings of this AV software by some reputable site and can it run simultaneously with my Avast! AV software? Download and install on two Win 7 machines (one 32bit and one 64bit) was smooth and successful. Scans found no problems on either machine. I will be installing a portable version to use as another tool in my arsenal to fix client's machines. Thanks to Moosoft and GAOTD for letting us evaluate this software. I can't get this to install on win 7. I get an error message that this is already being used by another program so it can't install. Odd! I've tried several times, and guess it just isn't going to happen. Thank you, it installed and although I had the same "You have code" message earlier today it looks as if the problem was sorted because I just managed to connect, get the code and register. @Eric, I installed it on both my laptop and Desktop and it Registered fine. Just shut down and reopen, which is what i did and voila, registered? Thank you, it installed and although I had the same "You have code" message earlier today it looks as if the problem was sorted because I just managed to connect, get the code and register. @Eric, I installed it on both my laptop and Desktop and it Registered fine. Just shut down and reopen, which is what i did and voila, registered? 2.6 Message : Catastrophic failure. The Cleaner 2012 seems quite a nice AV app, though I don't know how it will fare compared to other products when it comes to doing it's job, protecting your systems from mal-ware. It does not have all of the bells & whistles that you'll find on many alternatives -- functionality & features seem on a par with Microsoft's free Security Essentials. Comparing the 2, The Cleaner has a smaller footprint, uses less resources scanning, & still manages to be slightly faster on a full disk scan. Neither offers a full-fledged firewall however on the order of what you get with a package from McAfee, & The Cleaner is a bit unique in using a separate app for real-time monitoring -- with everything else I've seen/used you turn monitoring on/off, but with The Cleaner you simply right-click the TCActive taskbar icon & select Exit, which is actually quicker. AV software I've used from Microsoft, McAfee, CA, Norton etc. all have intertwined themselves with Windows, making switching AV brands sometimes an iffy chore, sometimes causing problems upgrading to a newer version, causing compatibility problems between AV-related apps & so on. The full version of The Cleaner doesn't do that, & itself is Almost portable, having just a few registry entries for uninstall, file paths etc. -- if need be I think it would work in the portableapps.com format, but that wouldn't provide that much more than what you get in the portable version which requires 0 added work. Running The Cleaner & TCActive I noticed that while they used less resources overall than Security Essentials, idle they used more CPU. Updating stores a backup in the app's folder, which is good from the standpoint of not having to hunt for it, bad in the sense that you have to manually delete it if you want or need to recover space -- it looks like log files may need weeding out often as well. Like Security Essential & McAfee, The Cleaner phones home when you start it to verify your license term hasn't expired. My guess is that the ip recording when you get your license is more a one-time GOTD only thing to prevent banking codes that could be given away or sold... otherwise the software would be useless in a portable version, & no use at all to those on dial-up [which is still a sizable population]. Downloading the portable version I didn't like this one statement: "No Helper Service included, this may limit the ability to remove rootkits. ", which I think implies something a bit misleading... if you go to Wikipedia they offer one definition of a rootkit that to me focuses more on semantics, & in that sense MooSoft is correct, but not necessarily as rootkits are found in the real world -- to me that statement implies that if you use the full version you're protected &/or The Cleaner will somehow remove one. It may or may not. A rootkit might modify Windows' kernal or otherwise hide itself from Windows, so Windows is totally unaware a file(s) even exists -- detecting an as yet unknown rootkit of that sort is something any AV app may fail at. On that topic SysInternals [Microsoft.com] RootkitRevealer page [ http://goo.gl/jtZDV ] has info & links & the related forums have posts with links etc. that may be useful, e.g. http://goo.gl/ZCfjy . 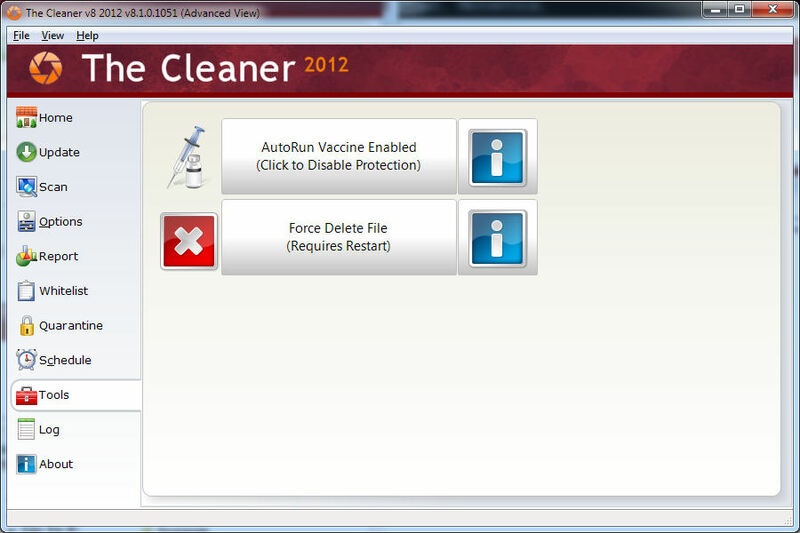 The Cleaner 2012 seems quite a nice AV app, though I don't know how it will fare compared to other products when it comes to doing it's job, protecting your systems from mal-ware. It does not have all of the bells &amp; whistles that you'll find on many alternatives -- functionality &amp; features seem on a par with Microsoft's free Security Essentials. Comparing the 2, The Cleaner has a smaller footprint, uses less resources scanning, &amp; still manages to be slightly faster on a full disk scan. Neither offers a full-fledged firewall however on the order of what you get with a package from McAfee, &amp; The Cleaner is a bit unique in using a separate app for real-time monitoring -- with everything else I've seen/used you turn monitoring on/off, but with The Cleaner you simply right-click the TCActive taskbar icon &amp; select Exit, which is actually quicker. AV software I've used from Microsoft, McAfee, CA, Norton etc. all have intertwined themselves with Windows, making switching AV brands sometimes an iffy chore, sometimes causing problems upgrading to a newer version, causing compatibility problems between AV-related apps &amp; so on. The full version of The Cleaner doesn't do that, &amp; itself is Almost portable, having just a few registry entries for uninstall, file paths etc. -- if need be I think it would work in the portableapps.com format, but that wouldn't provide that much more than what you get in the portable version which requires 0 added work. Running The Cleaner &amp; TCActive I noticed that while they used less resources overall than Security Essentials, idle they used more CPU. Updating stores a backup in the app's folder, which is good from the standpoint of not having to hunt for it, bad in the sense that you have to manually delete it if you want or need to recover space -- it looks like log files may need weeding out often as well. Like Security Essential &amp; McAfee, The Cleaner phones home when you start it to verify your license term hasn't expired. My guess is that the ip recording when you get your license is more a one-time GOTD only thing to prevent banking codes that could be given away or sold... otherwise the software would be useless in a portable version, &amp; no use at all to those on dial-up [which is still a sizable population]. Downloading the portable version I didn't like this one statement: <em>"No Helper Service included, this may limit the ability to remove rootkits. "</em>, which I think implies something a bit misleading... if you go to Wikipedia they offer one definition of a rootkit that to me focuses more on semantics, &amp; in that sense MooSoft is correct, but not necessarily as rootkits are found in the real world -- to me that statement implies that if you use the full version you're protected &amp;/or The Cleaner will somehow remove one. It may or may not. A rootkit might modify Windows' kernal or otherwise hide itself from Windows, so Windows is totally unaware a file(s) even exists -- detecting an as yet unknown rootkit of that sort is something any AV app may fail at. On that topic SysInternals <em>[Microsoft.com]</em> RootkitRevealer page [ http://goo.gl/jtZDV ] has info &amp; links &amp; the related forums have posts with links etc. that may be useful, e.g. http://goo.gl/ZCfjy . @143 That is strange indeed and we will look into it. What is LiveNews, anyone? I could not find anything about it in Help. Update went very quickly, with enough feedback to prevent impatience. It took 18 minutes to SmartScan over 150 GB on my tri-core and found no malware; also, it took 2.67 hours to run a FullScan and again, no malware. Fast enough in this case, though I wouldn't exactly call it blazing speed, since it is still possible to read file names as they rotate through the little box on the GUI. (BTW, I like their GUI: it's clean and not the same as all the others.) It used 30% of my CPU's; hope that doesn't mean it would use nearly 100% of a single-core, for sure. Performance rates as good as long as it finds the bad stuff it's designed for - I have no way to check for that - and avoids too many false positives like some others, so far so good on this one. (I once had a different one try to delete my AV's definition file of all things.) As Mr.T might have said (but didn't), I pity the poor guy with only one core who runs this, as it will probably either take 3 times as long or use 90% of his CPU. FWIW, this is a fairly clean installation, in that although it has about 100 programs, only a few have been uninstalled so far. Maybe that helps keep down the false positives a little bit. Or, maybe, just maybe, the developers of this software have done their homework better than some other anti-malware progs. Pending someone running a comparison of the detection rates of this and its competitors, I'd have to give it one thumb up, and I'd be willing to change that to two thumbs up if its detection rate is now as good as SpywareTerminator and the others. @139, license is for 3 computers. @144, this indicates that the program is not registered. Please try registering it again. How is this program better than the freeware Spybot - Search & Destroy? Looking at the vendor's homepage the claim made there is The Cleaner will "scan your computer in as little as 2 minutes". It takes Spybot S&S 45 minutes to scan my 1TB 7200RPM SATA-300 Windows 7 main drive. How thorough can a 2 minute scan really be? How is this program better than the freeware Spybot - Search &amp; Destroy? Looking at the vendor's homepage the claim made there is The Cleaner will "scan your computer in as little as 2 minutes". It takes Spybot S&amp;S 45 minutes to scan my 1TB 7200RPM SATA-300 Windows 7 main drive. How thorough can a 2 minute scan really be? This software missed over 100 instances of malware that were later found by Exterminate It. Why even bother? p.s. I was able to get multiple keys with the same IP without any problems once they fixed things. This software missed over 100 instances of malware that were later found by Exterminate It. Why even bother? p.s. I was able to get multiple keys with the same IP without any problems once they fixed things.